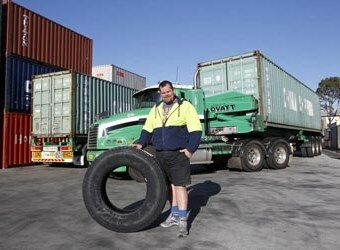 One of Sydney's iconic transport operators, Lovatt Transport, has adopted the Kumho KR truck tyre range across its fleet. Lovatt Transport uses Kumho KRT03 trailer tyres on most of its fleet of 40 trailers and the KRD03 drive tyres and KRS03 steer tyres on the majority of its 25 trucks. According to Lovatt Transport logistics manager Mark Lovatt, the Kumho KR range offers excellent performance for a competitive price and since making the change three years ago, Lovatt Transport hasn't looked back. "We're really happy with the performance of the Kumhos," said Mark Lovatt. "We were recommended Kumho by Advantage Tyres at Ingleburn and we were instantly attracted by the price. "Since then, we have been impressed with the kilometres we're getting out of the KRT03, KRD03 and KRS03 so we keep replacing our tyres with the Kumho KR range and we've never had an issue with any of them. "None of our drivers have had negative comments about the Kumhos and they are pretty quick to say something if there is a problem." Lovatt Transport has been servicing the Sydney Metropolitan, Newcastle and Canberra areas for more than 20 years - specialising in container transport from its depot at Botany Bay. The fleet of 25 trucks are a familiar sight on NSW roads painted in a vivid green and black colour scheme, always immaculately presented and ranging from eight tonne table tops to full B-Double container rigs. "The only vehicles and trailers that aren't using Kumho tyres are the ones that are new to our fleet which are on original tyres, but as soon as they are ready for replacement we throw the OE tyres away and fit Kumho," said Mr Lovatt. "The performance is equal to that of more expensive European brands but the price is much lower and adds considerably to Kumho's advantage. "In the three years we've been fitting them to our fleet we've never had a problem with Kumho Tyres and plan to continue fitting Kumho to our trucks and trailers." Kumho says it has succeeded in the development of superior tyres for all vehicles including high performance, passenger, sports utility and recreational vehicles, as well as light trucks, heavy truck and buses, industrial, agricultural, mining and construction vehicles as well as aircraft. Kumho produces more than 68 million tyres annually with a massive research and development program which comprises more than 600 research personnel and 300 testing machines at proving grounds in South Korea, China, Europe and North America. Kumho leads the world with the latest in tyre technology, safety and performance.